Language is predicated on telling the truth. It’s not that we always tell the truth. We expect lies from corporations, governments, and scam charities. In the name of profit, success, and power. The truth is an orphan any way. 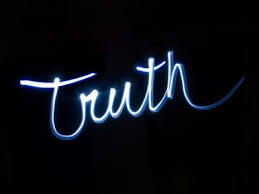 The truth that is important is not spelled with a capital “T”. By letting words mingle with things and not just desires. And will listen to what you say and not who you are. The point of truth seeking is not being right. And that someone else you don’t even like might be right. So they can keep selling oil. When they collect every penny from the poor. Of course in America this is nothing new. “I was run over by the truth one day. Tell me lies about Vietnam”. Because we will not teach and learn. The “English teacher” is the key. To feel how it sounds on the tongue and looks on the page. Once each day will keep the devil away.